A K-1 student at Stewart’s Creek Elementary School in Texas learning from the 30hands Pro app for iOS. What happens when we invite students to share stories inside the classroom? It can be a nerve-wracking task and understandably so – the idea of sharing personal (or non-personal) experiences with teachers and friends. It can be a challenge as for some it opens up a form of communication that is entirely new. But it can also challenge – and by that I mean challenge the dimensions of traditional student/teacher relationships. In her 2014 TEDTalk, educator and after-school media arts teacher, Emily Bailin, talks about the power of digital storytelling. In it she says that inviting teachers and pupils to share stories challenges the notion that it is the adults who are the only people with knowledge outside the classroom. She said bringing stories into the classroom bridges stronger connections from lived experiences outside schools with the content being delivered in school. This type of exchange of information is just as important as learning from a textbook, and it creates a sense of empathy between the teachers and students. Research, both old and more recent, seems to suggest this is true for learners of all ages. Anne Dyson (1987) found in her study of children’s collaborative storytelling that the most elaborate stories were told through talk and not through text. She also found that this form of verbal learning took considerable time off the task, meaning children completed their tasks quicker. In a similar study of first-graders,it was discovered that stories told during storytelling time were often the same as what they wrote about in their daily journals. Teacher Nancy Csak found that pupils were often excited to learn that they could share these written stories with their peers at story time. The impact of storytelling is also evident in college classrooms. Kellie Pickett of the University of Nebraska found this to be particularly true for students from low-income and ethnically diverse backgrounds. This is because faculty members and professors were able to form cultural perspectives which then allowed them to create positive and engaging learning environments. 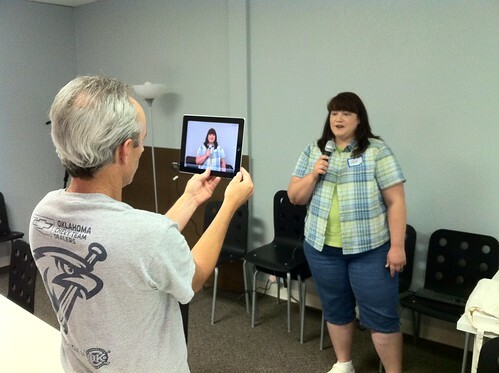 Digital storytelling benefits college students too! Photo credit: Moving at the Speed of Creativity (www.speedofcreativity.org). So what happens when we invite stories into the classroom, and tell them digitally? According to Bailin, digital storytelling makes the story much more powerful. Let’s take the simple story of where we’re from. The addition of pictures, videos and music adds an extra dimension that captivates, engages and encourages people to open their imaginations in ways they may not be used to. It allows pupils to be innovative, show their personalities, and share whatever unique knowledge they possess. Suddenly, the question of where we’re from can access a world of answers – a host of intersections leading to a location, a tree of names shaping a culture, and a basket of terms eventually forming a story. Storytelling can be a way of enhancing knowledge, skills and the standards of education. It is an art that has served as a popular education tool since ancient times and is utilized to pass knowledge from one generation to the other. As storytelling has progressed to digital storytelling in recent years, its ability to connect both students and teachers in the classroom has strengthened. The creativity involved with telling the stories, as well as the variety of media used to convey the message, has changed drastically. It is still a powerful instructional tool for both students and teachers with many modes of use. From personal narratives to the examination of historical events or stories that just inform or enlighten. And perhaps most importantly – digital storytelling can provide students with a stellar foundation of literacy in many areas, including visual literacy, technology literacy and media literacy, thus giving them a head start for future higher education.